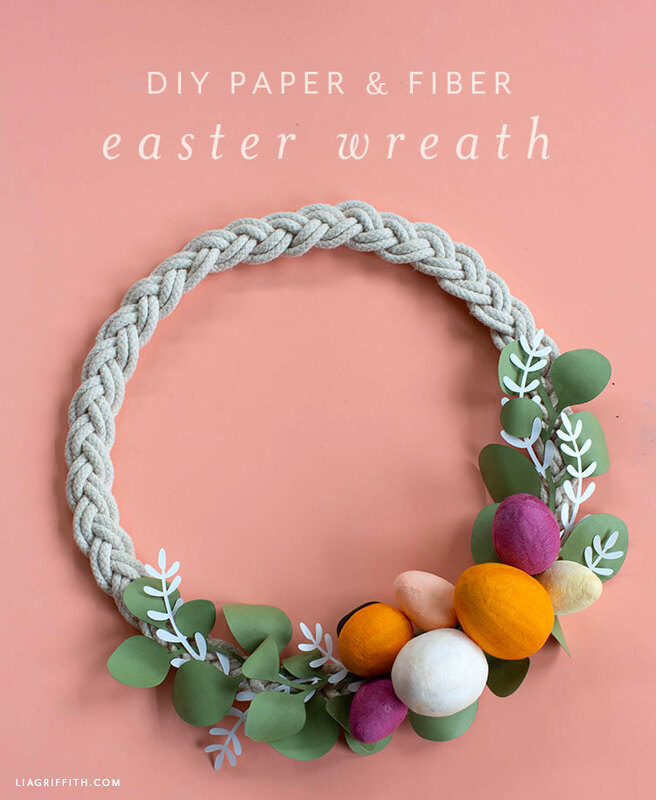 Although we’ve designed a lot of DIY wreaths over the years, we realized recently that we don’t have an Easter wreath — unless you count our spring wreath with the cute little bunny hanging out in the branches! 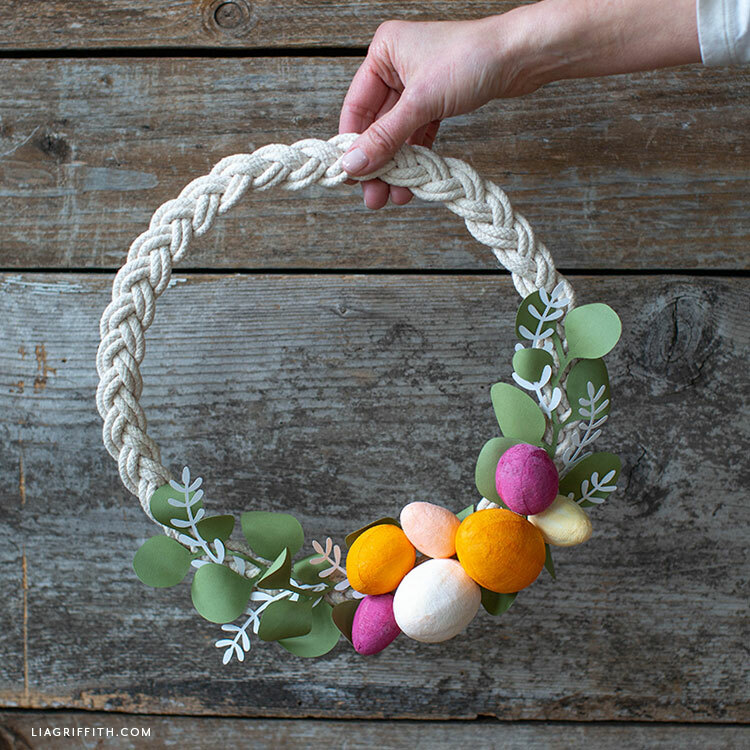 Well to remedy that, our designer Meagan created this gorgeous wreath for Easter. 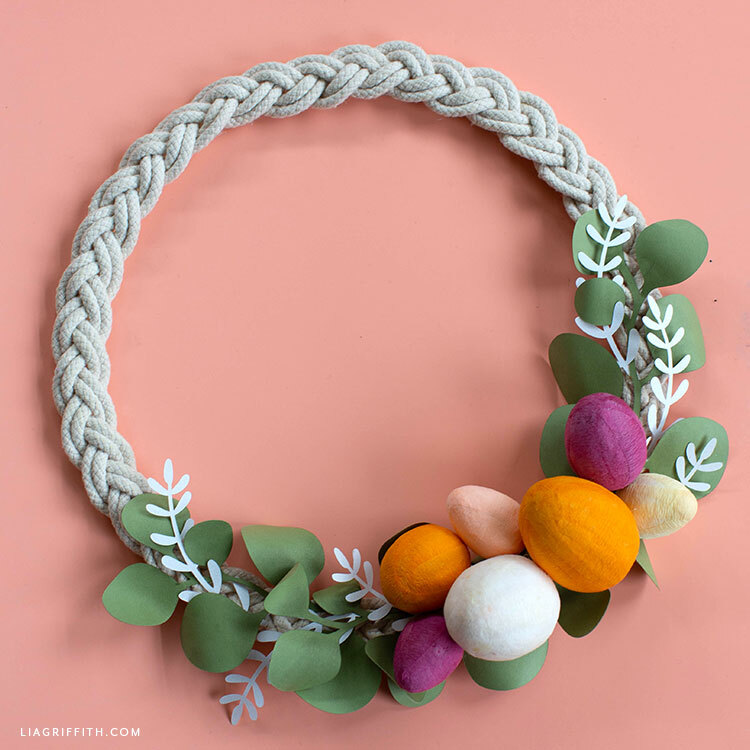 And today we are sharing how you can make this Easter wreath at home. So scroll down for the details! Combining different materials can give your DIY project such great texture. 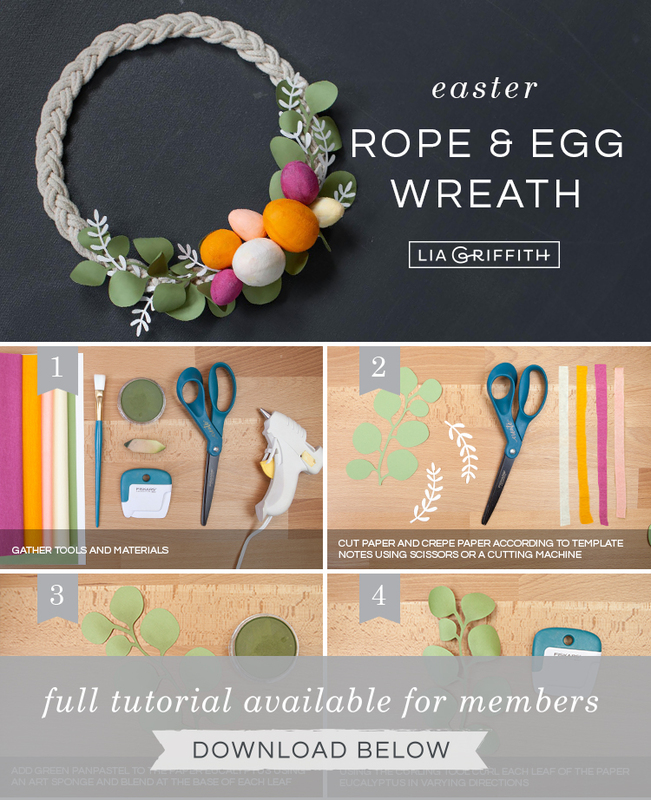 For the base of our Easter wreath, we used our braided rope wreath. And to give it more of an Easter feel with spring-like vibes, we added some paper greenery along with a mix of bright and neutral egg colors. These eggs are actually cotton-spun eggs we received from Smile Mercantile and covered with our own crepe paper. So fun! For more ideas on how to use these cotton-spun eggs, make sure to check out our painted Easter egg animals and our carrot and strawberry Easter eggs. Both of these projects are great kids’ crafts, too. 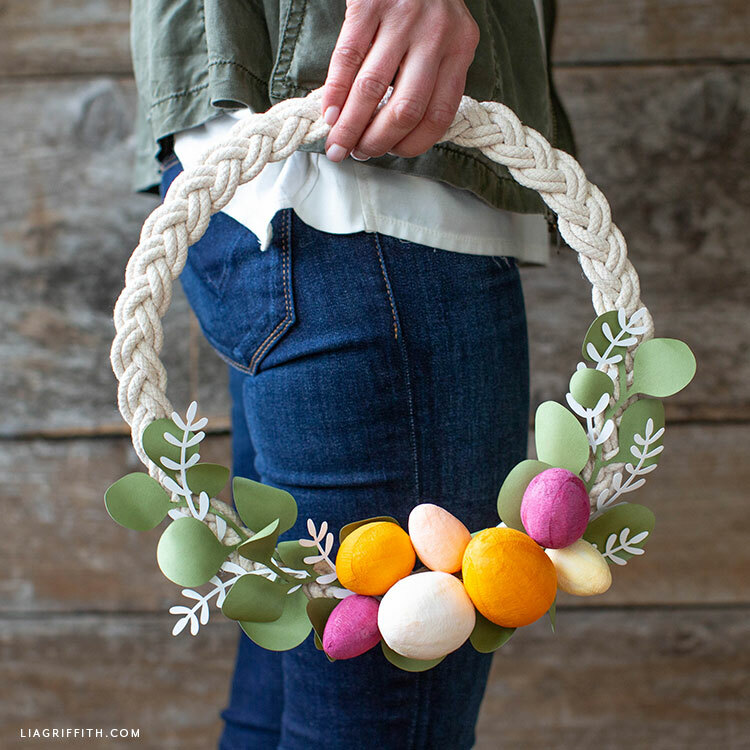 If you end up making this Easter wreath, let us know! We would love to hear your thoughts on this paper and fiber craft project. You can also share your pictures on our Facebook page for members or use the hashtag #MadeWithLia on your social pages. Gather your craft tools and materials. Then download the template below. 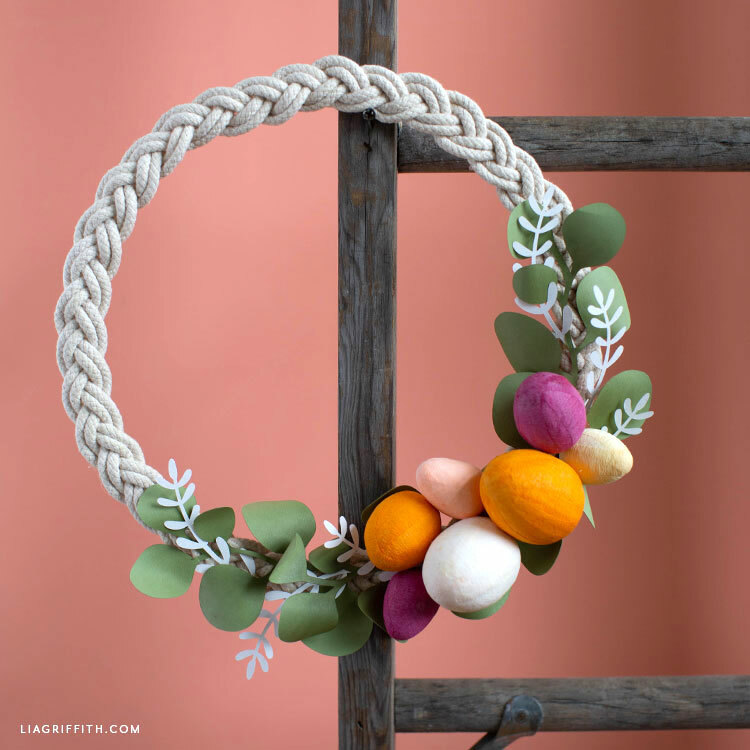 Note: Our braided rope wreath is a separate DIY project. Cut your paper and crepe paper according to the template notes, using scissors or a cutting machine. Add the green PanPastel to the paper eucalyptus with an art sponge and blend at the base of each leaf. Using the curling tool, curl each leaf of the paper eucalyptus in varying directions. Want more DIY ideas for Easter? Browse all of our Easter craft projects on the site. For more DIY home decor ideas and inspiration, connect with us on Instagram, Pinterest, and Facebook. You can also browse our video tutorials on paper flowers, home decor, and more. And if you have any questions or feedback, just let us know. Not yet a member? Take a peek at our membership options!